McNally Robinson TOP 100 BESTSELLING BOOKS FOR 2017 - ​19. More Babas, Please, Marion Mutala. ​On January 26th, more than 100 students and Instructors participated in a Building Bridges event organized by Indigenous Services and Intercultural Services at the Saskatoon Main Campus. Through a program rich with storytelling, music and dance, participants learned of the similarities between Métis and Ukrainian cultures, and their unique differences, as well as the role of the Métis in helping early Ukrainian settlers, and others, adapt to life in the 'new world'. Many thanks to storytellers and performers from both cultures for enriching the experience for all – Ukrainian violinist, Bill Gulka; Ukrainian author/storyteller, Marion Mutala; Métis illustrator/artist, Donna Lee Dumont; Métis fiddlers, Phil and Dallas Boyer; and our very own Brian Gallagher, Emcee Extraordinaire. To close the event, everyone enjoyed a steaming bowl of borscht accompanied by delicious bannock. The goal of the Building Bridges initiatives is to provide an opportunity to enhance appreciation and understanding between cultures. Please join us on March 8th for a Building Bridges International Women's Day Event, which will be held at the Saskatoon Main Campus. Thanks Bill Robertson for lovely article in today's paper. It is greatly appreciated. LIT Happens - Wes Funk interviews Marion Mutala about her first book - "Baba's Babushka: A Magical Ukrainian Christmas". Wes Funk is the host of the Saskatoon TV series LIT Happens, which showcases Saskatchewan's literary talent. - "Baba's Babushka: A Magical Ukrainian Easter". 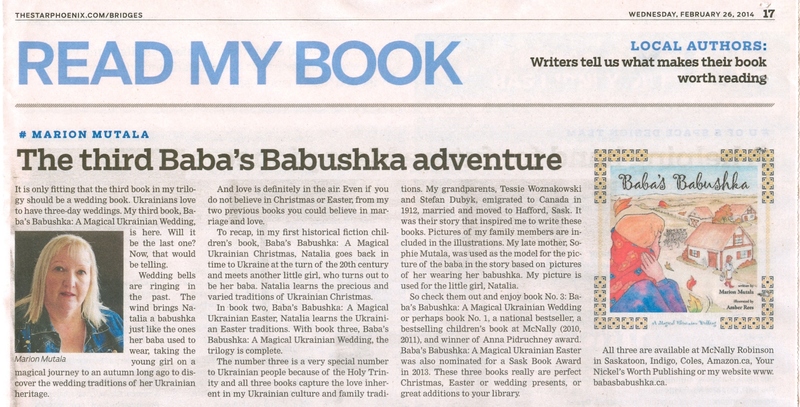 "Baba's Babushka: A Magical Ukrainian Christmas". 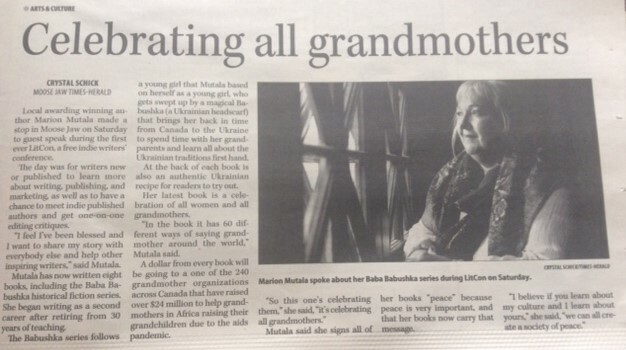 Award-winning author Marion Mutala has just released her fifth book. This one, The Time for Peace is Now, is unique because it is a smallsized, limited edition, handmade chapbook that Mutala wrote for charity. Marion Mutala earned a Bachelor of Education Degree in 1979 and Masters of Education Degree in 1996. With a mad passion for the arts, Marion Mutala loves to write, folkdance, sing, play guitar, garden, travel and read. Marion credits her 30 years of teaching to helping her develop unique stories, songs, and poetry. You can find her first two award winning bestselling books Baba’s Babushka: A Magical Ukrainian Christmas and Baba’s Babushka: A Magical Ukrainian Easter at a bookstore near you! Marion Mutala, Creator of "Baba's Babushka: A Magical Ukrainian Christmas".